Place the cedar wood plank in a large bowl. Add enough water to completely cover the plank. Let it soak at least 2 hours. Prepare the pineapple sauce by combining all the ingredients in a bowl. Cover and refrigerate for 2 hours. Remove the skin from the salmon and cut it into 4 equal portions. Coat with soy sauce and brown sugar. Wrap in plastic wrap and put it in the refrigerator until you’re ready to smoke it. Once the grill is hot, place the previously soaked wooden plank on the grill and close the lid. When a smell of smoke starts coming from the plank, open the grill and place the pieces of salmon on the plank. Close the grill lid and let the salmon cook for 20 to 30 minutes or until it is completely cooked. 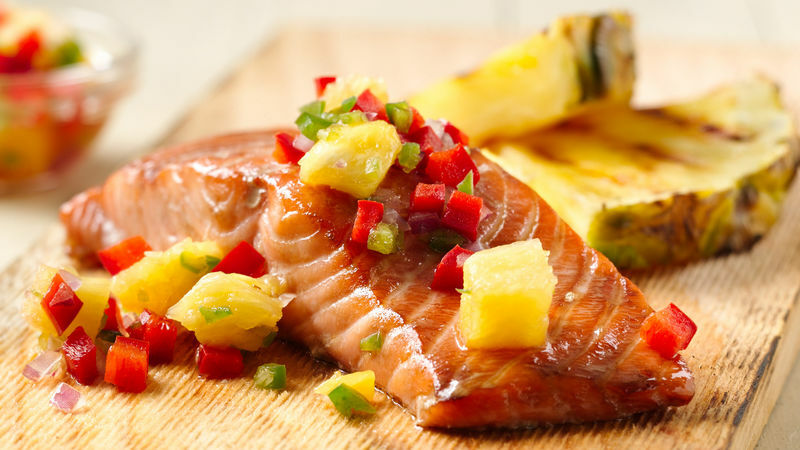 Place the salmon on individual plates and coat with the pineapple sauce. Serve immediately. You can buy the wooden plank at any hardware store. If you want a more exotic flavor, substitute yuzu juice (Asian citrus juice) for lemon juice.